Every February, the American Dental Association or ADA sponsors National Children’s Dental Heath Month (NCDHM) in the United States to raise awareness of the importance of good oral health in children. The good people at the ADA reach out to millions of people living in communities all across the country with special messages, events, literature and campaigns aimed at helping children and their families obtain and maintain good oral health. The campaign slogan of this year’s National Children’s Dental Health Month is “Sugar Wars”. Colorful posters for the campaign feature The Smileys, McGrinns and K9 in a spaceship, the USS SweetSwatter that’s equipped with toothbrush swatters that are combating the Sweet Tooth Invaders for good oral health. These posters help dental professionals, teachers and speakers teach kids how important it is take good care of their smiles. Throughout the month of February, the doctors and staff at our La Mesa dental practice will be stressing the importance of good oral care for children by talking to our young patients and their parents about how to properly care for their smiles. We will also be reminding parents to schedule dental checkups for their children. This is a good time of the year to remind parents to talk to your kids about the importance of having healthy smiles. Try to make these conversations fun and interesting so your kids are more apt to learn from them. 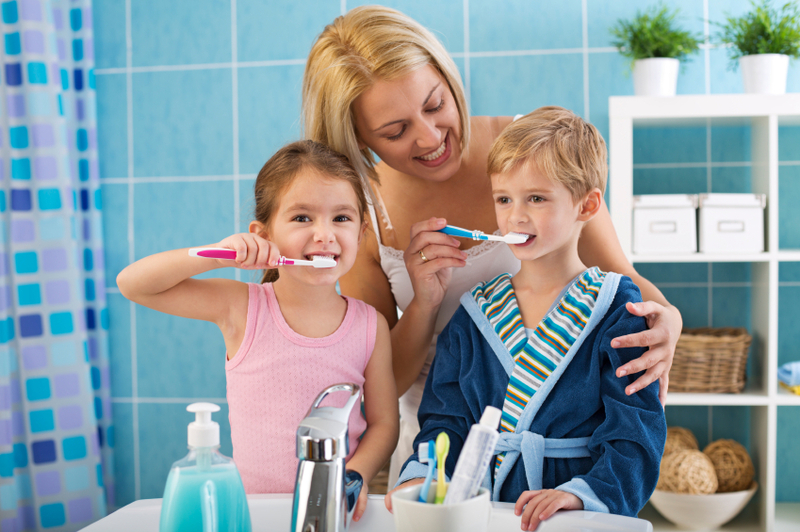 And because your children mimic what you do, demonstrate to your kids that having a healthy smile is important to you too by brushing and flossing well and eating healthy foods and snacks. This is a good time to talk with your children about the harmful effects sugar has on teeth. Instead of providing your children with sugary snacks like cookies and candies, offer them healthier alternatives like fresh fruits, nuts and yogurt. If you have any questions about early dental care, please don’t hesitate to contact us as we are always happy to speak with you! We love providing dental care to our youngest patients and work hard to make sure young children have a positive experience at our office so they will become a regular visitor for years to come! If you’d like to schedule an appointment for your child in our convenient east county office, please complete the ‘Appointment Request’ form that’s on our main website. One of our team members will then contact you to confirm your appointment time. We look forward to seeing you and your child in our office soon!